Just steps away from everything the neighbourhood has to offer - this quiet, NW corner suite is perfect for both empty nesters and young families. 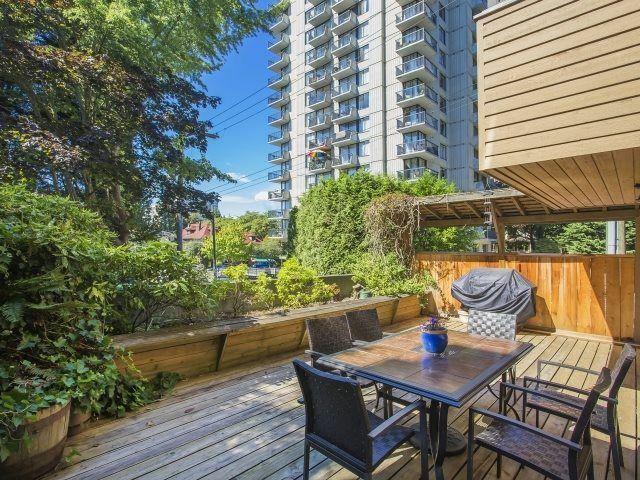 A rare find in the West End, this property boasts a private 400sf sundeck - ideal for gardening and entertaining friends! This property also features a spacious dining/living area with stone faced gas fireplace. Suite upgrades include renovations to the bathroom and beautiful hand scraped hardwood floors throughout the suite. The building is well maintained and includes new balconies, windows, siding and new pipes. Amenities include shared laundry, sauna and fitness room. This property comes with 1 parking and locker. Pets/rentals welcome.